The Internet is changing every aspect of our lives-business, entertainment, education, and more. Businesses use the Internet and Web-related technologies to establish Intranets and Extranets that help streamline business processes and develop new business models. Behind all this success is the underlying fabric of the Internet: the Internet Protocol (IP). IP was designed to provide best-effort service for delivery of data packets and to run across virtually any network transmission media and system platform. The increasing popularity of IP has shifted the paradigm from "IP over everything," to "everything over IP." In order to manage the multitude of applications such as streaming video, Voice over IP (VoIP), e-commerce, Enterprise Resource Planning (ERP), and others, a network requires Quality of Service (QoS) in addition to best-effort service. Different applications have varying needs for delay, delay variation (jitter), bandwidth, packet loss, and availability. These parameters form the basis of QoS. The IP network should be designed to provide the requisite QoS to applications. For example, VoIP requires very low jitter, a one-way delay in the order of 150 milliseconds and guaranteed bandwidth in the range of 8Kbps -> 64Kbps, dependent on the codec used. In another example, a file transfer application, based on ftp, does not suffer from jitter, while packet loss will be highly detrimental to the throughput. To facilitate true end-to-end QoS on an IP-network, the Internet Engineering Task Force (IETF) has defined two models: Integrated Services (IntServ) and Differentiated Services (DiffServ). IntServ follows the signaled-QoS model, where the end-hosts signal their QoS needs to the network, while DiffServ works on the provisioned-QoS model, where network elements are set up to service multiple classes of traffic with varying QoS requirements. Both models can be driven off a policy base, using the CoPS (Common open Policy Server) protocol. Cisco IOS® Software supports both the IntServ and DiffServ models of QoS, along with an optional CoPS-client functionality. IntServ provides for a rich end-to-end QoS solution, using end-to-end signaling, state-maintenance (for each RSVP-flow and reservation) and admission control at each network element. DiffServ, on the other hand, addresses the clear need for relatively simple and coarse methods of categorizing traffic into different classes, also called Class of Service (CoS), and applies QoS parameters to those classes. 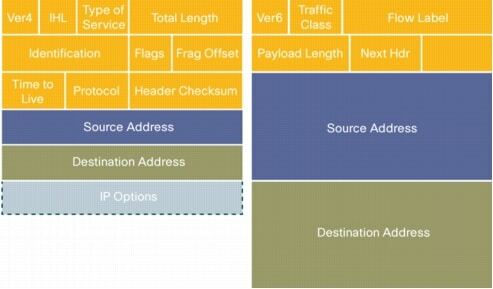 To accomplish this, packets are first divided into classes by marking the Type of Service (ToS) byte in the IP header. A 6-bit bit-pattern (called the Differentiated Services Code Point [DSCP]) in the IPv4 ToS Octet or the IPv6 Traffic Class Octet is used as shown in Figures 1, 2, and 3. When packets are classified at the edge of the network, specific forwarding treatments, formally called Per-Hop Behavior (PHB), are applied on each network element, providing the packet the appropriate delay-bound, jitter-bound, bandwidth, etc. This combination of packet marking and well-defined PHBs results in a scalable QoS solution for any given packet, and any application. In DiffServ, signaling for QoS is eliminated, and the number of states required to be kept at each network element is drastically reduced, resulting in a coarse-grained, scalable end-to-end QoS solution. WHY DO WE NEED DIFFSERV? The IETF defined models, IntServ and DiffServ, are two ways of considering the fundamental problem of providing QoS for a given IP packet. The IntServ model relies on the Resource Reservation Protocol (RSVP) to signal and reserve the desired QoS for each flow in the network. A flow is defined as an individual, unidirectional data stream between two applications, and is uniquely identified by the 5-tuple (source IP address, source port number, destination IP address, destination port number, and the transport protocol). Two types of service can be requested via RSVP (assuming all network devices support RSVP along the path from the source to the destination). The first type is a very strict guaranteed service that provides for firm bounds on end-to-end delay and assured bandwidth for traffic that conforms to the reserved specifications. The second type is a controlled load service that provides for a better than best effort and low delay service under light to moderate network loads. It is possible (at least theoretically) to provide the requisite QoS for every flow in the network, provided it is signaled using RSVP and the resources are available. • Every device along the path of a packet, including the end systems such as servers and PCs, need to be fully aware of RSVP and capable of signaling the required QoS. • Reservations in each device along the path are "soft," which means they need to be refreshed periodically, thereby adding to the traffic on the network and increasing the chance that the reservation may time out if refresh packets are lost. • Maintaining soft-states in each router, combined with admission control at each hop and increased memory requirements to support a large number of reservations, adds to the complexity of each network node along the path. • Since state information for each reservation needs to be maintained at every router along the path, scalability with hundreds of thousands of flows through a network core becomes an issue. Fortunately, many of these shortcomings have been remedied by the introduction of "RSVP Refresh Reduction and Reliable Messaging," "RSVP scalability enhancements," Proxy RSVP and many other feature enhancements that make RSVP more scalable and deployable. Before the IETF defined IP (Layer3) QoS methods, the International Union for Telecommunications, Telecommunications (ITU-T), the Asynchronous Transfer Mode (ATM) Forum, and the Frame-Relay Forum (FRF) had already arrived at standards to perform Layer2 QoS in ATM and Frame-Relay networks. The ATM standards define a very rich QoS infrastructure by supporting traffic contracts, many adjustable QoS knobs (such as Peak Cell Rate [PCR], Minimum Cell Rate [MCR], etc. ), signaling and Connection Admission Control (CAC) [Ref-A]. Alternatively, Frame Relay provides a simpler yet rich set of mechanisms to provide for a Committed Information Rate (CIR), congestion notification and Frame-Relay Fragmentation (FRF.12) [Ref-B]. Though these rich QoS mechanisms exist in Layer2 transport technologies, true end-to-end QoS is not achievable unless a Layer3 solution is overlaid. Service providers offering both ATM/Frame-Relay and IP services want to provide robust QoS solutions to customers. Mapping Layer3 QoS to Layer2 QoS is the first step toward achieving a complete solution that does not depend on any specific Layer2 technology. Both IntServ and DiffServ can be implemented over QoS-aware transports such as ATM and Frame-Relay. For example, the IntServ controlled-load service can implement using RSVP, over an ATM Variable Bit Rate, Real-Time (VBR-rt) Switched Virtual Circuit (SVC). With DiffServ, packets marked with different ToS-byte values can be sent over different ATM PVCs or SVCs. For example, high priority traffic may go over a VBR-nrt VC, and all other traffic may go over an Available Bit Rate (ABR) VC, with the VBR VC capable of preempting the ABR VC in case of congestion or failure. Similarly, Frame-Relay Traffic Shaping (FRTS) (slowing down the rate of transmission by buffering, in response to congestion notification by the FR switches), FRF.12 (packet fragmentation and interleaving on low speed FR links), and other mechanisms can be used to complement IP QoS. A true end-to-end QoS solution comprises both Layer3 and Layer2 QoS and is media independent. Introduction of a Gigabit Ethernet link somewhere along the path of a packet poses no problem to deliver QoS, as the Layer3 QoS is still preserved and can even be enhanced by mapping to the 802.1p (user-priority) QoS mechanism on Ethernet (RFC-1349). Cisco IOS QoS focuses on delivering exactly this model-inter-operability/mappings between Layer2 and Layer3 QoS over IP, ATM, Frame-Relay, Packet over SONET (POS), Ethernet, etc. Since per-flow QoS is difficult to achieve in an end-to-end network without adding significant complexity, cost, and introducing scalability issues, it naturally leads to thinking about classifying flows into aggregates (classes), and providing appropriate QoS for the aggregates. For example, all TCP flows could be grouped as a single class, and bandwidth allocated for the class, rather than for the individual flows. In addition to classifying traffic, signaling and state maintenance requirements on each network node should be minimized. The IETF realized this, and defined a mechanism to use the ToS field in the IPv4 header to prioritize packets as shown in Figures 1, 2 and 3. When packets are marked with the appropriate priority/IP precedence bits, any network node along the path of the packet knows the relative importance (priority level) of the packet, and can apply preferential forwarding to packets of higher priority levels. • The IP-precedence scheme allows only specification of relative priority of a packet. It has no provisions to specify different drop precedence for packets of a certain priority. For example, a network administrator may want to specify both HTTP and telnet traffic as high-priority packets. However, when there is congestion he/she wants the telnet packets to be dropped, before the HTTP (a valid reason may be because HTTP packets are carrying e-commerce traffic, while the telnet packets are carrying user-sessions within the company for their ERP applications). It is not possible to do this with the IP-precedence scheme. • The 3 bits restrict the number of possible priority classes to eight. Further, the network control and Internetwork control classes are usually reserved for router-generated packets such as routing updates, ICMP messages, etc. This is done to protect the packets that are necessary for the health of the network. However, this cuts down the usable classes for production traffic to six. 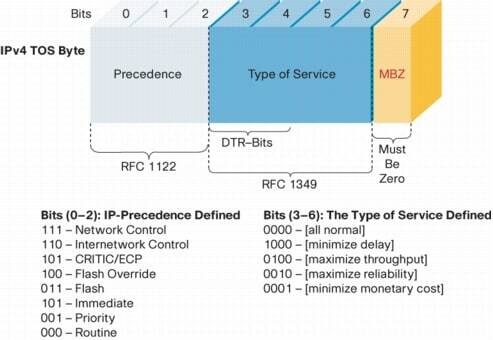 • IP-precedence and DTS bits (bits 3,4,5-the original type of service subfield) are not implemented consistently by network vendors today. In addition, RFC-1349 redefines the type of service subfield, by utilizing bits 3,4,5, and 6, and eliminating the DTS concept. All of the above reduce the chances of successfully implementing end-to-end QoS using this scheme. The IETF completed the Request for Comments (RFCs) for DiffServ toward the end of 1998. As stated in the DiffServ working group objectives [Ref-C], "There is a clear need for relatively simple and coarse methods of providing differentiated classes of service for Internet traffic, to support various types of applications, and specific business requirements. The differentiated service approach to providing quality of service in networks employs a small, well-defined set of building blocks from which a variety of aggregate behaviors may be built. A small bit-pattern in each packet, in the IPv4 ToS octet or the IPv6 traffic class octet, is used to mark a packet to receive a particular forwarding treatment, or per-hop behavior, at each network node. A common understanding about the use and interpretation of this bit-pattern is required for inter-domain use, multi-vendor interoperability, and consistent reasoning about expected aggregate behaviors in a network. Thus, the working group has standardized a common layout for a six-bit field of both octets, called the DS field. RFC 2474 and RFC 2475 define the architecture, and the general use of bits within the DS field (superseding the IPv4 ToS octet definitions of RFC 1349)." In order to deliver end-to-end QoS, this architecture (RFC-2475) has two major components-packet marking using the IPv4 ToS byte and PHBs. Unlike the IP-precedence solution, the ToS byte is completely redefined [Figure3]. Six bits are now used to classify packets. The field is now called the Differentiated Services (DS) field, with two of the bits unused (RFC-2474). 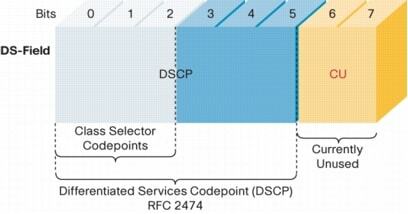 The six bits replace the three IP-precedence bits, and is called the Differentiated Services Codepoint (DSCP). With DSCP, in any given node, up to 64 different aggregates/classes can be supported (2^6). All classification and QoS revolves around the DSCP in the DiffServ model. The default PHB specifies that a packet marked with a DSCP value (recommended) of `000000' gets the traditional best effort service from a DS-compliant node (a network node that complies to all the core DiffServ requirements). Also, if a packet arrives at a DS-compliant node and its DSCP value is not mapped to any of the other PHBs, it will get mapped to the default PHB. To preserve backward compatibility with the IP-precedence scheme, DSCP values of the form `xxx000,' where x is either 0 or 1, are defined. These codepoints are called class-selector codepoints. Note that the default codepoint is also a class-selector codepoint (`000000'). The PHB associated with a class-selector codepoint is a class-selector PHB. These PHBs retain almost the same forwarding behavior as nodes that implement IP-precedence based classification and forwarding. For example, packets with a DSCP value of `110000' (IP-precedence 110) have a preferential forwarding treatment (scheduling, queuing, etc.) as compared to packets with a DSCP value of `100000' (IP-precedence 100). These PHBs ensure that DS-compliant nodes can co-exist with IP-precedence aware nodes, with the exception of the DTS bits. Similar to how RSVP via the IntServ model provides for a guaranteed bandwidth service, the Expedited Forwarding (EF) PHB is the key ingredient in DiffServ for providing a low-loss, low-latency, low-jitter, and assured bandwidth service. Applications such as VoIP, video, and online trading programs require a robust network-treatment. EF can be implemented using priority queuing, along with rate limiting on the class (formally, a BA). Although EF PHB when implemented in a DiffServ network provides a premium service, it should be specifically targeted toward the most critical applications, because if congestion exists, it is not possible to treat all or most traffic as high priority. EF PHB is especially suitable for applications (like VoIP) that require very low packet loss, guaranteed bandwidth, low delay and low jitter. The recommended DSCP value for EF is `101110' (RFC-2474). The rough equivalent of the IntServ controlled load service is the Assured Forwarding PHB (AFxy). It defines a method by which BAs can be given different forwarding assurances. For example, traffic can be divided into gold, silver, and bronze classes, with gold being allocated 50 percent of the available link bandwidth, silver 30 percent, and bronze 20 percent. The AFxy PHB defines four AFx classes: AF1, AF2, AF3, and AF4. Each class is assigned a certain amount of buffer space and interface bandwidth, dependent on the SLA with the Service Provider/policy. Within each AFx class, it is possible to specify 3 drop precedence values. If there is congestion in a DS-node on a specific link, and packets of a particular AFx class (for example AF1) need to be dropped, packets in AFxy will be dropped such that the dP(AFx1) <= dP(AFx2) <= dp(AFx3), where dP(AFxy) is the probability that packets of the AFxy class will be dropped. The subscript "y" in AFxy denotes the drop precedence within an AFx class. In our example, packets in AF13 will get dropped before packets in AF12, before packets in AF11. This concept of drop precedence is useful, for example, to penalize flows within a BA that exceed the assigned bandwidth. Packets of these flows could be re-marked by a policer to a higher drop precedence. Table 1 shows the DSCP values for each class and drop precedence. AFx class can be denoted by the DSCP `xyzab0,' where `xyz' is 001/010/011/100, and `ab' represents the drop precedence bits (RFC-2597). Baking the perfect pie requires both the best ingredients, as well as a great recipe. The DiffServ pie, (the DS-region) is composed of one or more DS-domains, possibly under multiple administrative authorities. 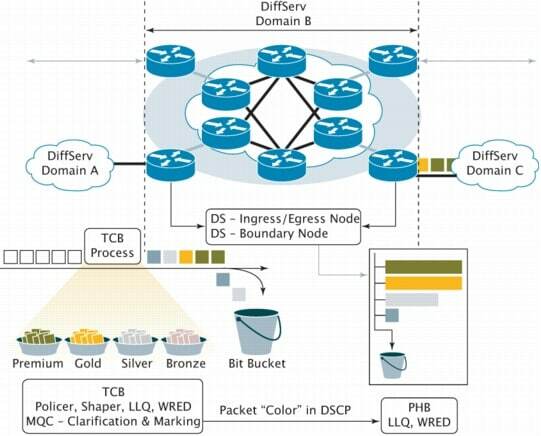 Each DS-domain is prepared by using the DSCP and the different PHBs. The secret to the whole recipe is the SLA or policy. Figure 4 gives a pictorial overview of this end-to-end architecture. For true QoS, the entire IP path that a packet travels must be DiffServ enabled. An example service policy-EF gets 10 percent, gold 40 percent, silver 30 percent, bronze 10 percent, and best effort traffic (default class/PHB) the remaining 10 percent of the bandwidth. Gold, silver, and bronze could be mapped to AF classes AF1, AF2, and AF3 for example. This can be enforced in any part of the cloud, including end-to-end. A DS-domain is made up of DS ingress nodes, DS interior nodes (in the core), and DS egress nodes. An ingress or egress node might be a DS boundary node, connecting two DS domains together. Functionally, all DS ingress and egress nodes can be categorized as a boundary nodes, since they act as a demarcation point between the DS-domain and the non-DS-aware (L2-LAN, etc.) network. Typically, the DS boundary node performs traffic conditioning. A traffic conditioner typically classifies the incoming packets into pre-defined aggregates, meters them to determine compliance to traffic parameters (and determines if the packet is in profile, or out of profile), marks them appropriately by writing/re-writing the DSCP, and shapes (buffers to achieve a target flow rate) or drops the packet in case of congestion. Figure 5 illustrates the typical traffic conditioner at the edge of a DS-domain. A DS Internal node enforces the appropriate PHB by employing policing or shaping techniques, and sometimes re-marking out of profile packets, depending on the policy or the SLA. • Classifier: Selects a packet in a traffic stream based on the content of some portion of the packet header. • Meter: Checks compliance to traffic parameters (ie: token bucket) and passes results to the marker and shaper/dropper to trigger action for in/out-of-profile packets. • Shaper: Delays some packets to be compliant with the profile. Today, the DiffServ model only defines the use of the DSCP and the four PHBs. The PHBs describe the forwarding behavior of a DS-compliant node. The model does not specify how these PHBs may be implemented. A variety of queuing, policing, metering, and shaping techniques may be used to affect the desired traffic conditioning and PHB. The Modular QoS CLI (MQC) is a provisioning mechanism in Cisco IOS Software, which allows for separation of packet classification (class-maps), from policies (policy-maps) applied on the defined classes, from the application of those policies on interfaces and sub-interfaces (service-policy) [Ref-D]. The MQC forms the basis for provisioning DiffServ, and all the QoS mechanisms are part of the class-maps (classification), or policy-maps (policing, shaping, queuing, congestion avoidance, packet marking, Layer2 CoS marking, etc.). Packets entering a DiffServ Domain (DS-Domain) can be metered, marked, shaped, or policed to implement traffic policies (as defined by the administrative authority). In Cisco IOS Software, classifying and marking is done using the MQC's class-maps. Metering is done using a token bucket algorithm, shaping is done using Class-based Traffic Shaping (CBTS), or Class-based Frame Relay Traffic Shaping (CB-FRTS), and policing is done using class-based policing. On the value add side, Cisco also provides for the class-based QoS management information base (CBQoSMIB), where statistics for each class (regardless of congestion) can be gathered for management purposes. Table 2 lists the operators for traffic classification and QoS policy actions. The simplest concept in traffic conditioning (and in providing PHB for AF classes in the core of a DS-domain), packets are metered, and different actions are taken, depending if the packet in question conforms, violates, or exceeds the configured average-rate, committed Burst (Bc), or excess Burst (Be) [Ref-E]. A packet can be transmitted, dropped, or remarked with a different DSCP value (moving it into a lower AF class, or changing its drop precedence value), depending on the configured policy. Sometimes, it is better to buffer packets instead of dropping them in the case of congestion-especially for UDP-based applications. This can be done by configuring an average-rate, Bc and Be. However, the biggest difference between policing and shaping is that packets are buffered in case of congestion in shaping. CB-FRTS can also be employed, to have the traffic slow down when there is congestion reported by the frame-relay switch. As the packet leaves the Ingress router, and enters into the network core, PHBs are enforced, depending on the packet marking, with the appropriate DSCP. In Cisco IOS Software, EF can be implemented using Low Latency Queuing (LLQ). AFxy PHBs can be implemented using a combination of Class Based Weighted Fair Queuing (CBWFQ) [Ref-E], and Weighted Random Early Detect (WRED) [Ref-F]. Delay sensitive traffic, such as VoIP, needs to be given strict priority all along the packet path. For this to occur, LLQ can be used at each hop. To ensure that excess voice traffic does not interfere with traffic of other classes, this priority queue is policed (for more information, please see section on policing above). CBWFQ using the MQC allows you to carve out bandwidth among the various classes defined. Bandwidth may be allocated to each class on an absolute basis (specified in Kbps), or as a percentage of the [sub] interface bandwidth (to which this policy will be applied). Within an AF class, packets can be dropped based on the drop precedence scheme using WRED. The policing, as described in the section above, can be used to implement the PHB in the core as well. Even if packets of a class are policed at the edge of a network, the core will have many streams of a particular class merging from its numerous input interfaces, and will need to police the class further (at a higher aggregate rate). In implementing DiffServ using Cisco IOS Software, class maps are defined and the policy maps are created using the defined class maps. Finally, apply the policy on the desired interface (or sub-interface) in either the incoming or outgoing direction. Note: Network Based Application Recognition (NBAR), is another powerful method in Cisco IOS Software to identify traffic streams that use variable TCP/UDP ports-such as in Citrix. Note: The policer behavior above is compliant with RFC-2597. Traffic that is within the token bucket parameter Bc in an interval, is within the configured access rate, traffic between Bc and Be is excess traffic, and traffic that is more than Bc + Be is violate traffic that will be dropped. In addition to providing all the core DiffServ functionality, Cisco IOS Software makes it possible to define arbitrary DSCP values (local use) and associate almost any kind of policy with them. For example, HTTP flows between subnet A and B may be categorized into a BA with a DSCP value of "100011" and provided 100 Kbps of bandwidth end-to-end. The IETF has divided the possible 64 DSCP values into three pools (RFC-2598) as show in the Table 3. Note: Any value from pool #1, #2, or #3 can be used. Packets can be classified and marked using the existing IP-precedence technique. A service model applicable to typical modern networks with a combination of delay-sensitive (VoIP, real-time apps, etc. ), bandwidth-sensitive (TCP, FTP, HTTP, H.323 video, etc. ), and loss-sensitive (TCP, UDP, etc.) traffic is the premium + olympic model. The olympic model, as the name implies, divides traffic into gold, silver, and bronze classes with the gold class being more important than the silver, than the bronze class. A variety of techniques (as described previously) can be used to implement this policy. Combined with best-effort service, this model can be conveniently called the olympic+ model. Enterprises that deploy DiffServ are able to benefit tremendously by being able to deploy QoS quickly and easily in the network. Business critical and multimedia applications can be prioritized appropriately. The IP network can be transformed from a best-effort framework to a rich DiffServ region. Service Providers offering a combination of QoS and VPN services stand to profit and gain the competitive edge. Cisco is committed to providing a tight integration between DiffServ and Multi Protocol Label Switching (MPLS), and enabling differentiated services over an MPLS cloud. Many MPLS-DiffServ features are already available, and more will be available soon. [Ref-G]. Cisco IOS Software allows IntServ and DiffServ to co-exist as two models for end-to-end QoS as shown in Figure 6. The DiffServ domain passes the reservation requests transparently, while providing policy-based PHBs through it. The devices outside of the DS-domain reserve bandwidth using RSVP. 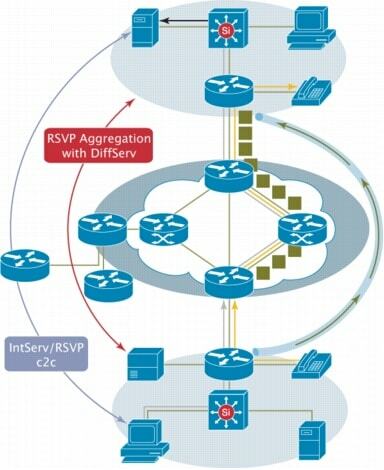 • Provisioning-Unlike RSVP/IntServ, DiffServ needs to be provisioned. Setting up the various classes throughout the network requires knowledge of the applications and traffic statistics for aggregates of traffic on the network. This process of application discovery and profiling can be time-consuming, although tools such as NBAR application discovery, protocol analyzers, and Remote Monitoring (RMON) probes can make these activities easier. • Billing and Monitoring-Management is still a big issue. Even though packets/sec, bytes/sec, and many other counters are available via the class-based Management Information Base (MIB), billing and monitoring are still difficult issues. For example, it may not be sufficient to prove to a customer that 9 million VoIP packets got the EF PHB treatment at all times, since it is possible that the qualitative nature of the calls that the customer made were very poor. • Loss of Granularity-Even though QoS assurances are being made at the class level, it may be necessary to drill down to the flow-level to provide the requisite QoS. For example, although all HTTP traffic may have been classified as gold, and a bandwidth of 100Mbps assigned to it, there is no inherent mechanism to ensure that a single flow does not use up that allocated bandwidth. It is also not easy (although not impossible) to ensure that the manufacturing department HTTP traffic gets priority before the HTTP traffic of another department. The MQC allows you to define hierarchical policies to accomplish this. However, it is able to control things at a flow/granular level. • QoS and Routing-One of the biggest drawbacks of both the IntServ and DiffServ models is the fact that signaling/provisioning happens separately from the routing process. 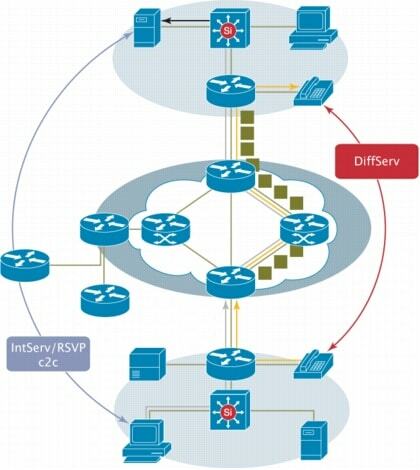 There may exist a path (other than the non-default Interior Gateway Protocol [IGP], such as OSPF, ISIS, EIGRP, and so on or Exterior Gateway Protocol [EGP], such as BGP-4, path) in the network that has the required resources, even when RSVP/DiffServ fails to find the resources. This is where Traffic Engineering (TE) and MPLS come into service. True QoS, with maximum network utilization, will arrive with the combination of traditional QoS and routing. Cisco IOS Software also supports full RSVP aggregation, allowing reservation through a DS-domain and mapping of the reservation to a DSCP and PHB. The reservations will be "fat pipes" that change very slowly. This aggregated reservation overcomes the problems of maintaining thousands of RSVP soft states in the routers and the flooding of refresh messages as shown in Figure 7. For seamless QoS, with complete management, provisioning, and signaling support, the entire network needs to be an efficient ecosystem. Applications, hosts, switches, routers, and other network entities need to all be aware of the concept of QoS, at various levels. 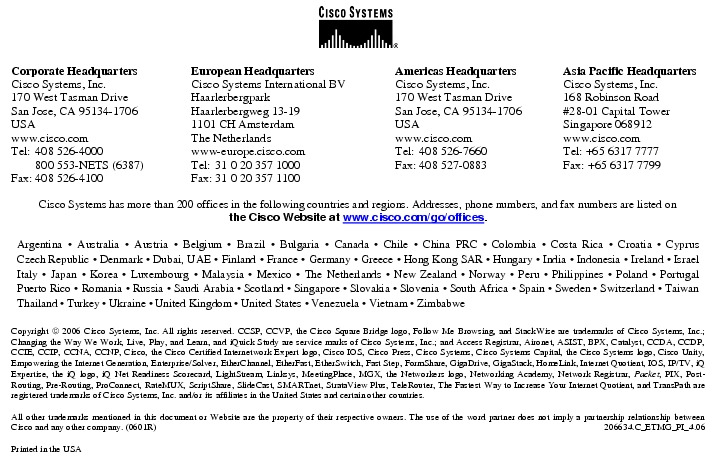 Additional information about Cisco IOS QoS technology can be found at http://www.cisco.com or by contacting your local Cisco representative.